According to the New Oxford Dictionary, the word gem \jem\ is a noun that is defined as a person or thing considered to be outstandingly good or special in some respect. By this definition, the quarter-section of native prairie grassland formerly owned by mixed grain and cattle producer Peter Galawan of Lenore, Manitoba can undoubtedly be described as a gem. The 160-acre plot located northeast of Virden has never been broken and for the most part, has been kept completely intact. To the average person, this doesn’t mean much, however, to the people who are actively engaged in protecting wildlife habitat this is worth celebrating. The Manitoba Habitat Heritage Corporation (MHHC) is an organization that strives to maintain and enhance fish and wildlife habitat throughout the province. When the organization was presented with this generous land donation by Peter Galawan to protect this quarter in perpetuity, it was an honour to accept the gift. 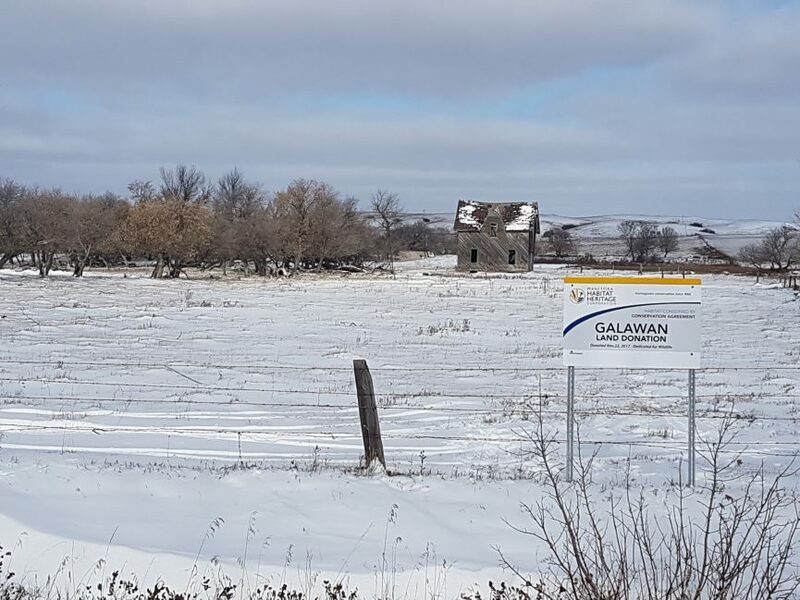 Carol Graham, MHHC Conservation Specialist, said the property is sentimental to the Galawan’s as the family yard site is located on the corner of the property and as a child, Mr. Galawan spent a great deal of time on the native, prairie grassland exploring what Mother Nature had to offer. They viewed the space as a sanctuary for wildlife. The property is home to many grassland birds and is supportive of Species at Risk such as the Burrowing Owl, Ferruginous Hawk, and Sprague’s Pipit. With diverse landscapes surrounding the property, other animals such as sharp-tailed grouse find the habitat suitable as well. Having lived on the property for many years, Mr. Galawan also took a special interest in observing insects such as beetles, butterflies, and moths. “We often see that with producers, they become in tune with the environment. Where insects are concerned there is a benefit or a risk to crops, so producers are often quite observant of the species that inhabit their land. Landowners, in general, tend to have an innate interest in what the natural landscape has to offer and what it holds for the future,” said Graham. The Galawan property is significant in its rarity for being kept in its natural state for so many years and in providing a much-needed benefit to wildlife. With MHHCs land management practices, the family can be assured that this parcel of land will continue to provide people with an opportunity to develop an interest in wildlife with the hope that many will recognize and value the different species that are part of the prairie landscape.